Figure 1: CDC and FEMA test data for PCO Process. Innovative Labs was formerly Aria Acqua. Normalised ratios of baseline samples for formaldehyde in FEMA trailers post Hurricane Katrina. Value of 1.0: no effect on formaldehyde concentrations. Value of 0.75: Moderate reduction of formaldehyde. Value of 0.5: significant reduction of formaldehyde. Figure 2: The PCO process utilising UV light and titanium dioxide react to create water and carbon dioxide. Figure 3: The TCO process where manganese oxide removes VOCs and converts them into water and carbon dioxide. Figure 4: Illustrates the number of VOCs removed on a first pass conversion with Innovative Labs’ photocatalytic oxidation process as tested by Lawrence Berkeley National Laboratory. Figure 5: Represents system longevity performance of manganese oxide and titanium dioxide. Percentage of formaldehyde removal in 128 cubic foot enclosed chamber, with an initial concentration of 500 ppb. 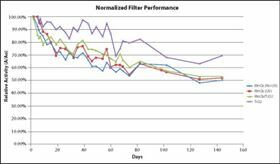 All filters exhibit extended longevity in indoor air environments using formaldehyde as a destruction proxy. Figure 6: Illustrates purification system performance data for rapid formaldehyde destruction of manganese oxide and titanium dioxide filters in enclosed chambers - 128 cubic foot chamber at ambient temperature, and with100 CFM fans. Figure 7: Manganese oxide test slides show continuous catalytic activity under constant formaldehyde (HCHO) exposure without loss in performance. In 2007, Hurricane Katrina hit the Gulf Coast causing catastrophic destruction. The US government recognised the issue at hand and housed many of the displaced occupants in FEMA trailers, which were manufactured with large amounts of formaldehyde. Subsequently, Innovative Labs participated in a US government and FEMA funded study to develop a formaldehyde removal filtration process. NASA, the CDC (Center for Disease Control) and Lawrence Berkeley National Laboratory (LBNL) conducted testing for an air filtration system to remove formaldehyde from the trailers. Out of 16 competing companies, Innovative Labs had developed the only photocatalytic air purification system to remove formaldehyde efficiently and effectively and have proven filter longevity (See Figure 1 - Aria Acqua is now Innovative Labs). Since its inception, Innovative Labs has now developed two catalytic technologies: thermocatalytic air filtration using manganese oxide (MnOx) as a filtration media, and photocatalytic air filtration using titanium dioxide (TiO2) as a filtration media. Chief executive officer of Innovative Labs John Webley adds that it was the concern for the health and well-being of those exposed to large amounts of formaldehyde that prompted the company to get involved in finding a solution. • 14% decrease in productivity in the workplace. • 3% decrease nationwide in productivity. • Estimated monetary losses as much as US$60 billion. • US$10-23 billion lost in respiratory healthcare costs. • US$3-6 billion lost due to allergy and asthma cases. Issues of litigation should be addressed since formaldehyde, a common VOC, was declared a carcinogenic chemical by the National Toxicology Department in June 2011. Numerous lawsuits have been filed with regards to the Brazilian Blowout hair straightening treatment and embalming chemicals in funeral homes, where formaldehyde is involved. Formaldehyde is a colourless, strong smelling VOC commonly used as a preservative. It can be found in particle board, household products, glues, fibreboard and plywood. The OSHA Formaldehyde Standard (29 CFR 1910.1048) works to create safe levels of formaldehyde in the workplace to protect employees. The permissible exposure limit (PEL) is 0.75 parts per million (ppm) of formaldehyde for a time weighted average of eight hours. The short term exposure limit (STEL) is 2 ppm for a 15 minute time period. Any levels of formaldehyde above 0.1 ppm will cause irritation of the respiratory tract. Clearly there is a discrepancy between the PEL limit and the 0.1 ppm irritation threshold. This alludes to the problematic nature of creating public policy in regards to indoor air quality, where multiple chemical sensitivities can occur at low levels. One way to solve indoor air quality issues is through gas-phase filtration. The photocatalytic oxidation (PCO) process combines oxygen, water and VOCs on the catalyst surface to produce CO2 and H2O under UV lights (see Figure 2). Photo refers to the UV lights, while oxidation is the familiar combustion process of fires. Burning wood produces mainly CO2 and H2O, the same byproducts as PCO technology. Catalytic refers to the process being quick, as well as the unchanging, self-cleaning nature of the filter. Theoretically, a small amount of catalyst could react equally well with 1 gram of VOCs as well as with 1000 grams of VOCs, and still remain unchanged. Catalysts such as this have been used for decades in automobiles, known as catalytic converters - turning smog and emissions into CO2 and H2O. Both principles are the same. Innovative Labs’ PCO process uses nanoparticle titanium dioxide (TiO2) as the catalyst. Titanium dioxide is used extensively in sunscreens for its UV absorbing capabilities, cheap price and its non-toxicity. It is the white pigment found in many paints, as well as toothpaste, gum and numerous other foods. Interestingly, when nano-sized, titanium dioxide particles exhibit many novel properties not found when bound, as in paints. When exposed to UV light, TiO2 behaves as a wide band-gap semi-conductor. TiO2 absorbs high-energy photons, promoting its electrons to a higher energy level. These electrons, and subsequent electron-holes, react with surface bound molecules (VOCs, oxygen, H2O), creating radicals, and allowing them to react with each other, eventually creating CO2 and H2O. Though PCO has been around for decades, its use is not widespread because many PCO filters have poor longevity and performance, lasting only a few months before deactivating. Innovative Labs has researched many varieties of TiO2 and various formulations to arrive at a long-lasting and high-performing filter. Intermediate by-products are a concern amongst people familiar with the technology. The oxidation process does eliminate a large number of VOCs. However, a small percentage remains incompletely oxidised, and re-enter the airstream as different compounds. Ironically, some studies show a net production increase in formaldehyde and acetaldehyde under heavy VOC load, since these molecules are breakdown products of larger VOCs, though overall there is a net reduction in total VOCs. Innovative Labs found a solution to this problem by employing a separate filter behind the TiO2 that works specifically on formaldehyde and acetaldehyde. This manganese oxide (MnOx) based filter does not require UV light, and is also a catalyst, but has a lower oxidative-potential than TiO2, limiting its realm of VOCs to those easily oxidised (i.e. formaldehyde and acetaldehyde). This method controls harmful by-products from TiO2. Thermocatalytic oxidation is a nano-catalyst technology which utilises manganese oxide (MnOx), a common mineral abundant in nature, and is often used in fertilizers as a micronutrient. It is called a thermocatalyst because of its catalytic abilities to regenerate from ambient temperature, and increases activity as temperature increases. The process is also oxidative, resulting in CO2 and H2O formation (see Figure 3). 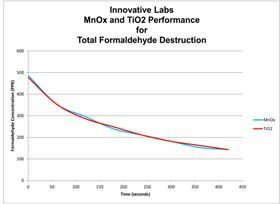 Formaldehyde is the main target of MnOx filters, although it does work on other VOCs, but slower. The great benefit of MnOx is that it does not require any extraneous equipment to function (UV lights), unlike TiO2; purification begins once in the air stream. This allows it to be installed in any conventional air duct system. MnOx works by uniting oxygen and VOCs on the catalyst surface. The complete mechanism is still a mystery, but many postulate that MnOx donates its own oxygen to VOCs, thereby ‘oxidising’ them, and then replaces its lost oxygen with O2 from the air stream, thus regenerating itself. Titanium dioxide (TiO2) is an effective method for the removal of harsh VOCs, such as formaldehyde, ethylhexanol, hexanal, acetaldehyde and many others (see Figure 4). The process has the added benefit of UV 254 germicidal lights, which eliminate bacteria and viruses. It operates at room temperature, and it is self-cleaning and non-toxic. Manganese oxide (MnOx) is an efficient method for the removal of formaldehyde and a handful of other VOCs. MnOx is active at room temperature and has proven longevity (see Figure 4). There is no extra energy required for MnOx, because the catalytic process does not need UV light. This is an effective solution to air purification due to reductions in energy usage providing rapid ROI (return on investment). In September 2005, a study was conducted at Lawrence Berkeley National Laboratory (LBNL) on saving energy and improving indoor air quality (IAQ). It is theorised that It may be possible to reduce outdoor air supply rates by 50% or more, while simultaneously maintaining indoor air quality and saving energy [Hodgson, 2005]. Reducing ventilation rates would save energy given the low pressure drop of the filters without extra energy to run the filters. This in turn could generate LEED ratings for green building construction. 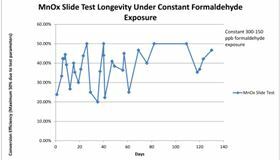 Given the test data, (see Figure 5) after 160 days running we see a relative activity of 50-70% with exposure to formaldehyde and VOCs over the time ratio. The proposed longevity/filter life of manganese oxide and titanium dioxide is a year or more. With regards to rapid formaldehyde destruction with manganese oxide and titanium dioxide (see Figure 6), at 500 ppb we see the formaldehyde concentrations drop to 150 ppb over 440 seconds (128 ft3 chamber, ambient temperature, 100 CFM fans). John Webley, chief executive officer of Innovative Labs, believes the development of advanced technologies to remove VOCs is at the forefront of filtration. 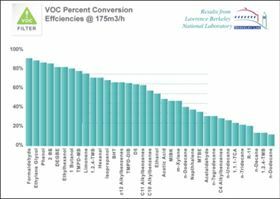 He recently explained that as a research and development company, Innovative Labs has tested many filters to see their effectiveness on VOCs, with often poor results due to the fact that most are not engineered well. Chemical filters and carbon filters use an adsorption process, which is a good method for capturing larger molecules, but smaller molecules are the ones posing the largest threat to the health of individuals. With formaldehyde classed as a carcinogenic chemical, new technology is needed to address the issue of VOCs. Innovative Labs is a green-tech start-up focusing on the research and development of gas-phase filtration processes: thermocatalytic filtration (TCO) and photocatalytic filtration (PCO) to remove Volatile Organic Compounds in residential and commercial applications. Innovative Lab’s mission is to solve indoor air quality issues while building a business with a philanthropic world health focus.